The Procession of the Venerable Wood of the Life-Creating Cross of the Lord: In the Greek Horologion of 1897 the derivation of this Feast is explained: "Because of the illnesses that occur in August, it was customary, in former times, to carry the Venerable Wood of the Cross through the streets and squares of Constantinople for the sanctification of the city, and for relief from sickness. 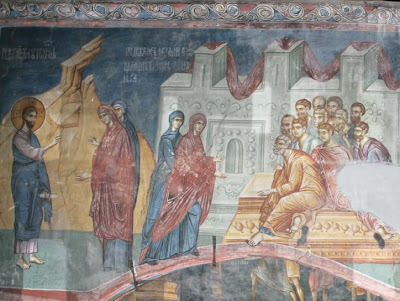 On the eve (July 31), it was taken out of the imperial treasury, and laid upon the altar of the Great Church of Hagia Sophia (the Wisdom of God). 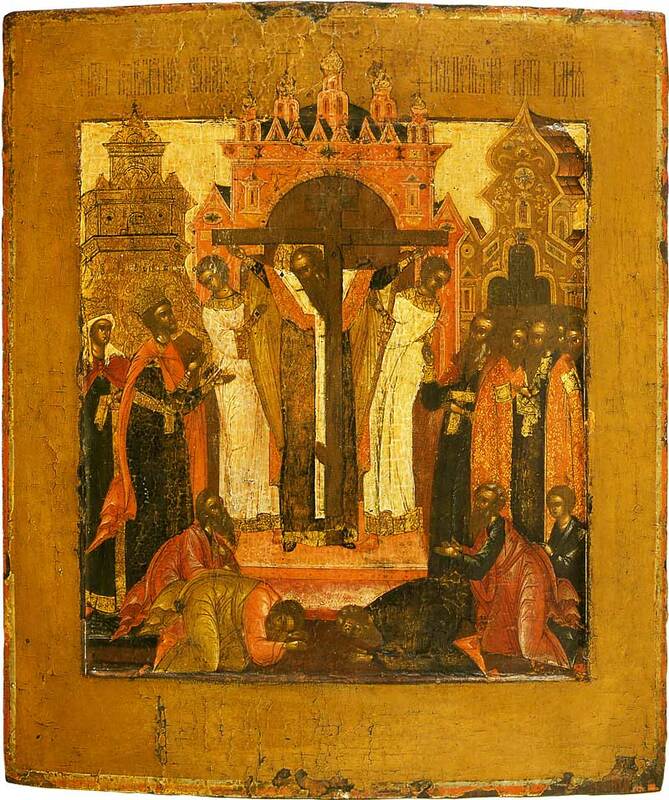 From this Feast until the Dormition of the Most Holy Theotokos, they carried the Cross throughout the city in procession, offering it to the people to venerate. 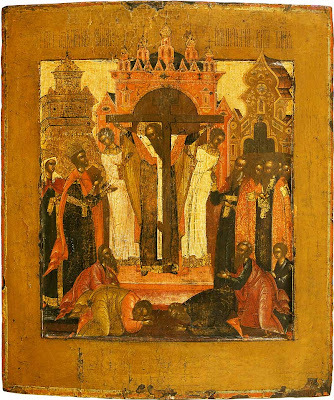 This also is the Procession of the Venerable Cross." 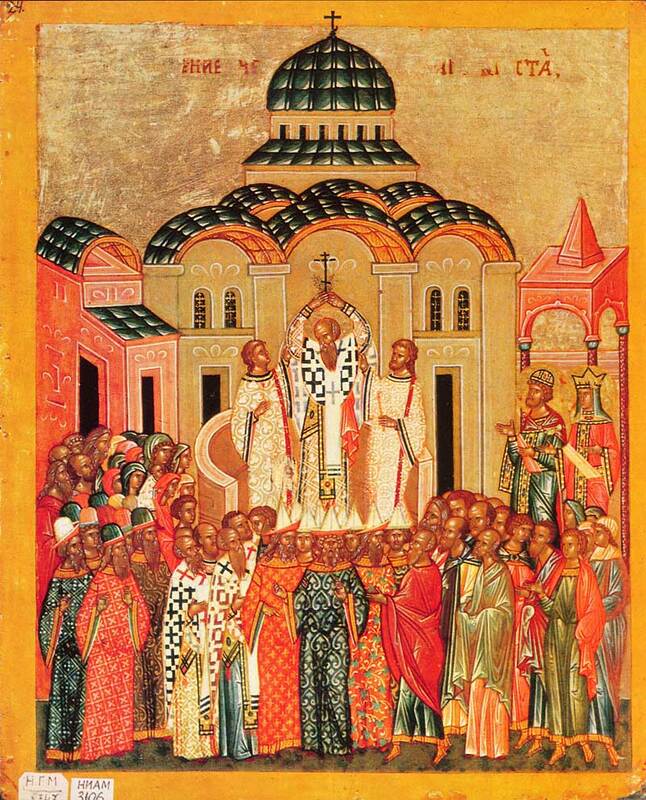 In the Russian Church this Feast is combined also with the remembrance of the Baptism of Rus, on August 1, 988. 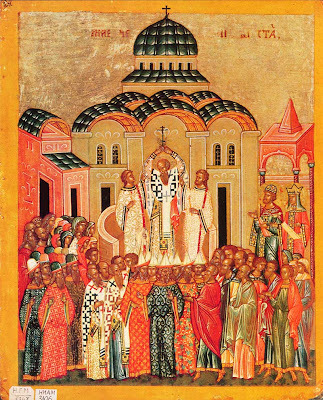 In the "Account of the Order of Services in the Holy, Catholic and Apostolic Great Church of the Dormition," compiled in 1627 by order of Patriarch Philaret of Moscow and All Rus, there is the following explanation of the Feast: "On the day of the Procession of the Venerable Cross there is a church procession for the sanctification of water and for the enlightenment of the people, throughout all the towns and places." 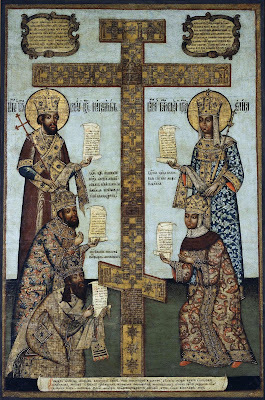 Knowledge of the day of the actual Baptism of Rus was preserved in the Chronicles of the sixteenth century: "The Baptism of the Great Prince Vladimir of Kiev and all Rus was on August 1." In the present practice of the Russian Church, the Lesser Sanctification of Water on August 1 is done either before or after Liturgy. Because of the Blessing of Water, this first Feast of the Savior in August is sometimes called 'Savior of the Water." There may also be a Blessing of New Honey today, which is why the Feast is also called "Savior of the Honey." 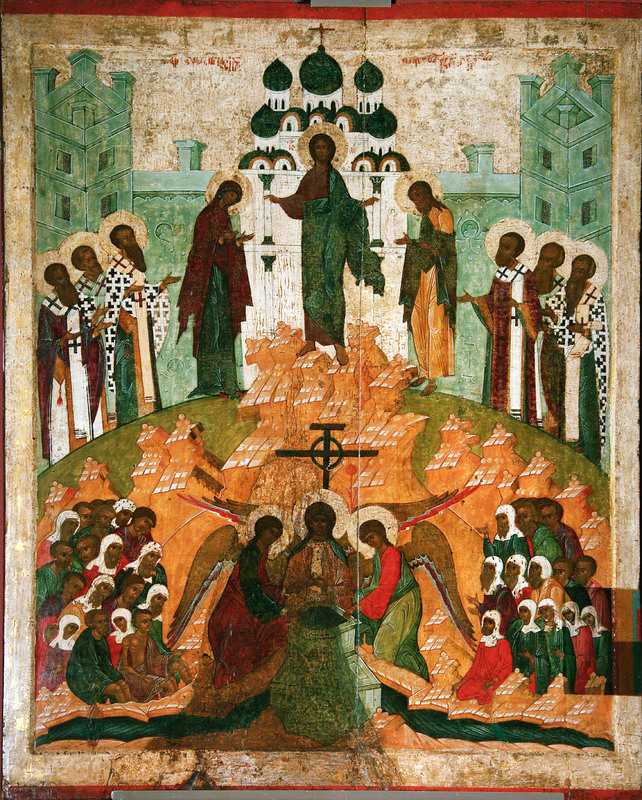 From this day the newly gathered honey is blessed and tasted. 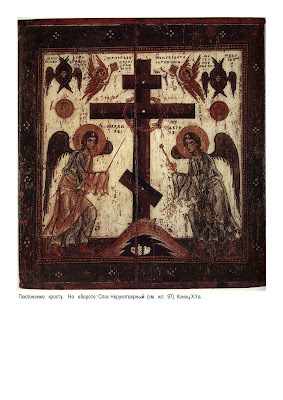 Stichera of the precious Cross. Tone 4. As noblest of Martyrs. As general protection, as source of sanctification, let us embrace the precious Cross; for it calms sufferings, brings an end to diseases and delivers sufferers from pains of every kind. More than the great deep it forms a sea with streams of wonders for those who faithfully venerate and reverence its image. We mortals, who sail among the waves of life and are storm-tossed by a tempest of sufferings, let us with faith take refuge in the precious Tree as a vessel of salvation, and it will silence the waves and the winds and break the passions, and we will reach in joy the haven of salvation without storms. The all-holy Cross has shone more brightly than the sun, shedding wonders like sunbeams and healings like flashes of lightning. Let us mortals, ever held fast by the darkness of dread dangers, draw near and we shall receive the light-bringing grace of healings as we magnify the God who was nailed to it in the flesh. 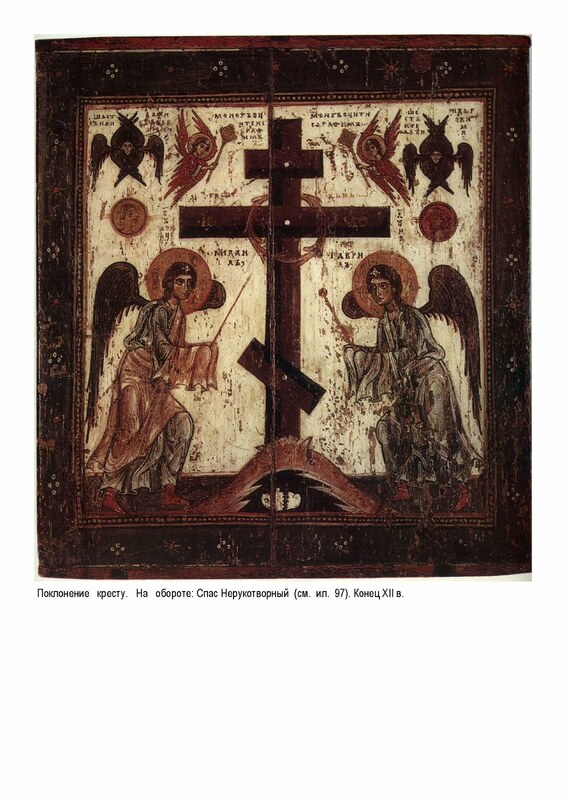 Canon of the Cross. Ode 9. Heaven was amazed. Once fixed to the Cross with nails through feet and hands, pierced in the side, your thirst quenched with vinegar and gall, you healed my wounds, O King of all, supremely good, the joy, the sweetness, glory and eternal redemption of all. 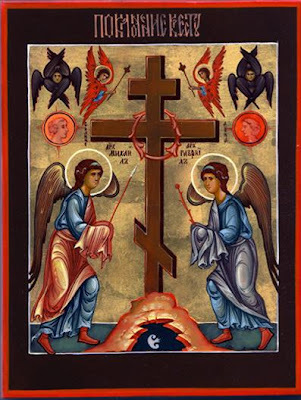 The Cross is the harbour of the storm-tossed, guide and support of the wandering, glory of Christ, strength of Apostles and Prophets, boast of Champions, refuge of all mortals. As we all see it set fourth in the midst, we greet it with loving devotion. ‘Without corruption I gave birth to you from the womb, whom the Father begot before the ages; how do corrupt mortals rend you, my Son, and inhumanly gouge your side with a lance, your hands and feet with nails?’ cried the All-pure, whom we fittingly magnify. During the veneration of the Cross, we sing the following Idiomel Sticheron. Come, believers, let worship the life-giving Tree on which Christ the King of glory willing stretched out his hands and raised up to the ancient blessedness us whom of old the foe, luring us through pleasure, had made exiles from God. Come, believers, let us worship the Tree though which we have counted worthy to crush the heads of invisible enemies. Come, all you families of nations, let us honour with hymns the Cross of the Lord. 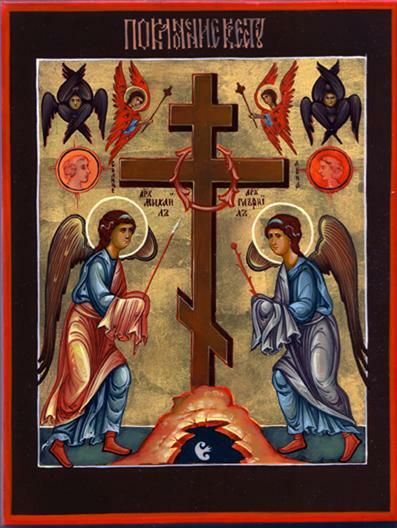 Hail, O Cross, the complete redemption of Adam. In you our faithful Sovereigns boast, as by your power they mightily defeat the people of Ishmael. We Christians, as with fear we now lovingly greet you, glorify God who was nailed to you, as we say, ‘O Lord, who were nailed upon it, have mercy on us as you are good and love mankind’. Mary Magdalene was one of the myrrh-bearing women and "equal to the apostles". She was born in the town of Magdala along the shore of Lake Gennesaret and was from the tribe of Issachar. She was tormented by seven evil spirits from which the Lord Jesus freed her and made her whole. (***See note below) She was a faithful follower and servant of the Lord during His earthly life. 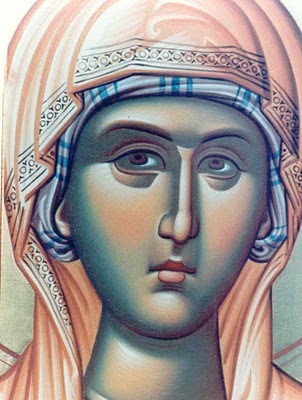 Mary Magdalene stood beneath the Cross on Golgotha and grieved bitterly and mourned with the All-Holy Birth-giver of God. After the death of the Lord she visited His sepulchre three times. When the Lord resurrected she saw Him on two occasions: once alone and the other time with the other myrrh-bearing women. 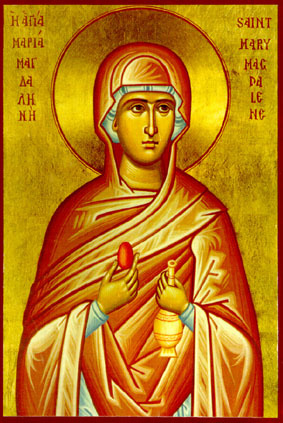 She traveled to Rome and appeared before Tiberias Caesar and presenting him with a red colored egg, greeted him with the words: "Christ is Risen!" At the same time, she accused Pilate before Caesar for his unjust condemnation of the Lord Jesus. Caesar accepted her accusation and transferred Pilate from Jerusalem to Gaul where, this unjust judge, in disfavor with the emperor, died of a dread disease. 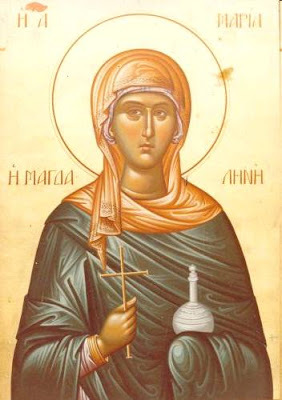 After that, Mary Magdalene returned from Rome [and having passed through all of Italy and France, along with Egypt, Phoenicia, Syria and Pamphylia preaching Christ, she returned to Jerusalem, where she stayed for a period of time with the Theotokos. (http://www.impantokratoros.gr/C92EE7A9.el.aspx) She returned] to Ephesus to St. John the Theologian whom she assisted in the work of preaching the Gospel. 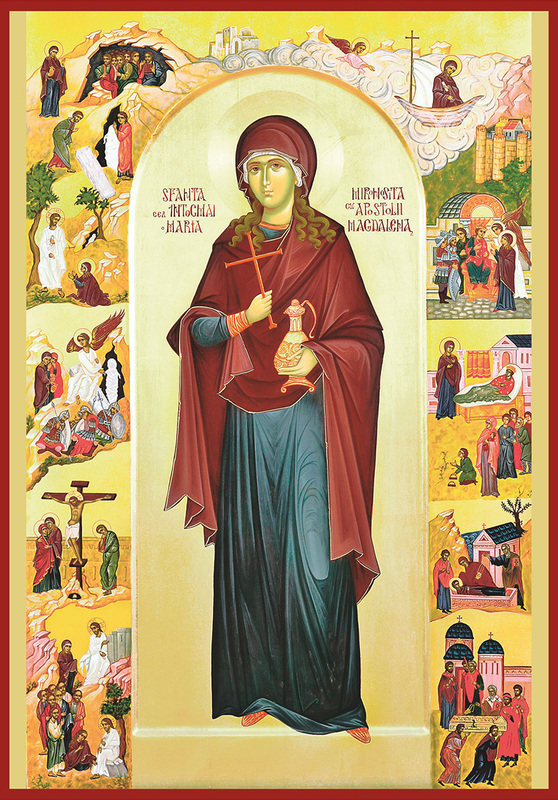 With great love toward the resurrected Lord, and with great zeal, she proclaimed the Holy Gospel to the world as a true apostle of Christ. 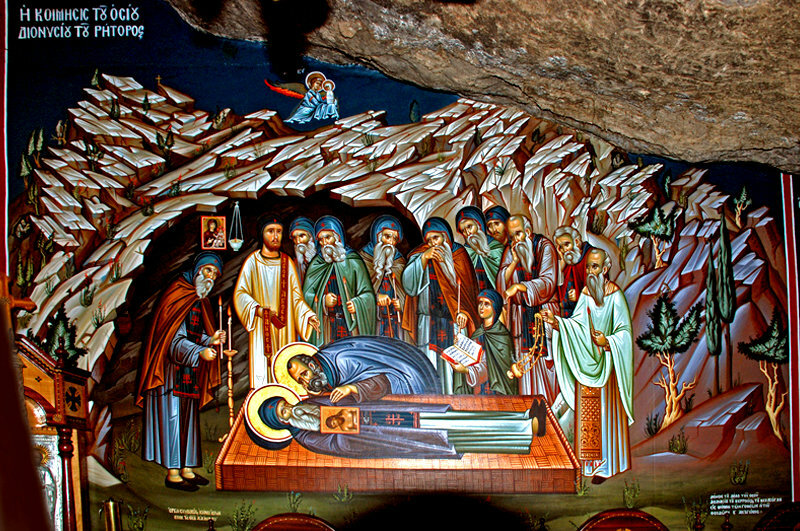 She died peacefully in Ephesus and, according to tradition, was buried in the same cave in which seven youths were miraculously put to sleep for hundreds of years and, after that, were brought to life and then died (August 4). 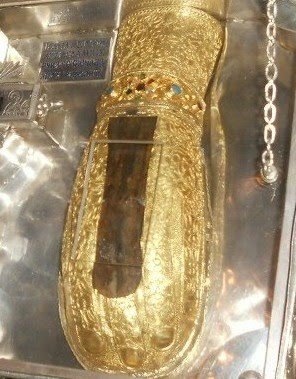 The relics of St. Mary Magdalene were later transferred to Constantinople. There is a Russian Orthodox convent dedicated to St. Mary Magdalene near the Garden of Gethsemane. 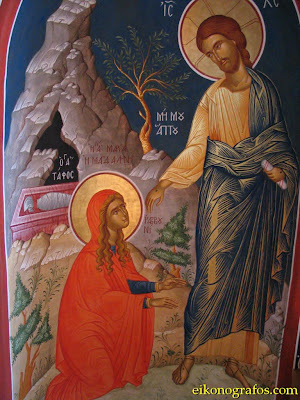 ***Note: "Although it is sometimes said that Saint Mary Magdalene was the "sinful woman" of the Gospel, this is nowhere stated in the tradition of the Church, in the sacred hymnology, or in the Holy Gospels themselves, which say only that our Lord cast seven demons out of her [Mark 16:9, Luke 8:2], not that she was a fallen woman." (http://www.goarch.org/chapel/saints_view?contentid=136). See the following site for a full discussion of this issue, along with a fuller life of the Saint (in Greek): http://www.impantokratoros.gr/C92EE7A9.el.aspx. Because of the bloody death of the Son of God. To Saint Magdalene, in darkness the world became wrapped. Without hope, in the dark Mary groped. His tomb to her is light but behold, the tomb is empty! Stolen she thought, naked and not anointed! Whom do you seek?Whom do I seek, you ask? To comfort me, do you wish! But, if you took Him away, where did you place Him? And with a sweet voice called her: Mary! The voice overly generous by life and power! With that same voice, He resurrected the dead. Life-creating voice, a miraculous voice! A New Day dawned to Mary and to the world. In keeping His commandments and laws, O holy Mary Magdalene, you followed Christ, who for our sake was born of a virgin, and in celebrating your most holy memory today, we receive forgiveness of sins by your prayers! Today has dawned for us as the morning star, the memory of the Righteous teacher, Nikodemos the heavenly-minded one, enlightening the Church. Come, therefore, those who love his words, let us celebrate in spirit and truth, and cry to him: hail, who through your virtuous life was made a dwelling-place of the Holy Spirit, working your mind. Hail, spiritual treasure-house, in which the many-varied treasures of wisdom are boundless. Hail, the divine root of Naxos, the adornment of the Holy Mountain, and the godly-wise teacher of the whole Church. Intercede, we pray, O Father, on behalf of our souls. 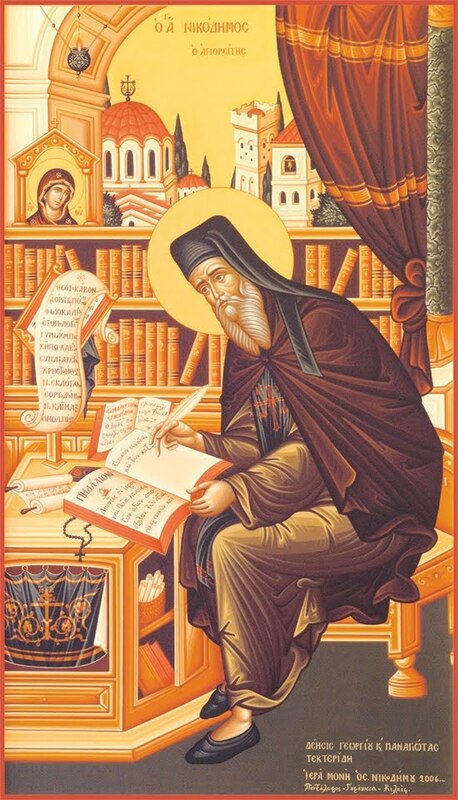 Through the word of your teaching, you cultivated well the fruits of eternal life, which you bore forth for the Church, O divine Nikodemos. As an ever-green tree planted by the streams of the waters of grace, through your God-inscribed tablets, you offered to us for all, the knowledge of salvation, as heavenly sweetness, through which we are delivered from the bitterness of the passions, as we partake of peace and great mercy from Christ. Thou hast been shown to be a godly clarion of holy oracles, teaching us righteousness. Thou wast adorned with wisdom's grace, O Father, Saint Nicodemus For thou didst present to all thy pure life as a paradigm, pouring forth enlightenment by the wealth of thy godly words. Thy teachings of salvation illumined as light the whole world, O righteous Father. Hail, adornment of Naxos, hail, torch-bearer of Athos. Hail, product of the dogmas of the fathers, hail analysis of the words of the saints. Hail, height of discernment and river of wisdom, hail, depth of divine knowledge and treasury of love. Hail, for you were shown forth a God-bearing writer, hail, for you were shown a godly studier. Hail, radiant ethic of prudence, hail, radiance of the fire above. Hail through whom the faithful are confirmed, hail, through whom the enemies are defeated. On the 14th day of this month (July), the memory of our Righteous and God-bearing father Nikodemos of the Holy Mountain, the most-wise teacher of the Church. Let us sing with the trumpet of songs, and dance festally, and skip for joy, at the light-bearing memory of our teacher. Priests and monks gathered, to applaud the God-bearer in hymns, who poured out for the world the streams of holy teachings, as that which from Eden watered all. O ranks of the Orthodox, let us together hymn the newly-radiant star of Orthodoxy, the treasury of wisdom, the container of virtues, the mouth of the Comforter, the pillar of prudent ethics, the godly-voiced tongue of theologians, the godly-shining lamp of chastity, the lyre of true dogmas, the godly guide of the faithful, let us therefore honor him with godly songs: O godly-wise Nikodemos, enlighten us by your teaching, and ever intercede to the Trinity, for those who honor you. 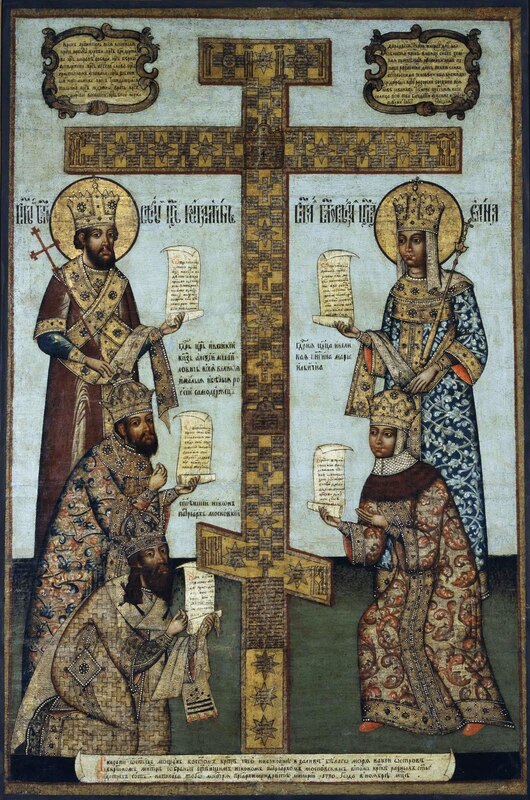 Hail new star of the Church, and holy adornment of the Orthodox, hail. 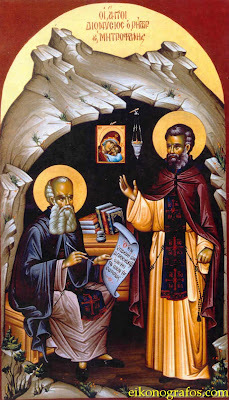 O light-bearing lamp of monastics, O Nikodemos most-blessed, the boast of Athos. 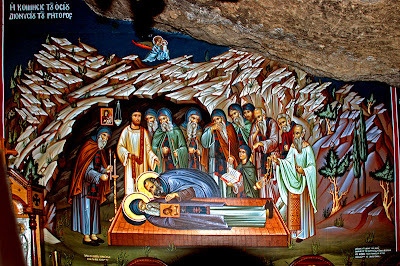 For the life of the Saint, see: http://full-of-grace-and-truth.blogspot.com/2009/07/st-nikodemos-of-holy-mountain.html. St Metrophanes was the disciple and fellow ascetic of St Dionysius the Rhetor. Although the exact time and place of his birth remain unknown, it is likely that he was born toward the end of the sixteenth century. For a time, he lived with his Elder St Dionysius at the Studion Monastery in Constantinople, but they desired a more intensive life of prayer and solitude. 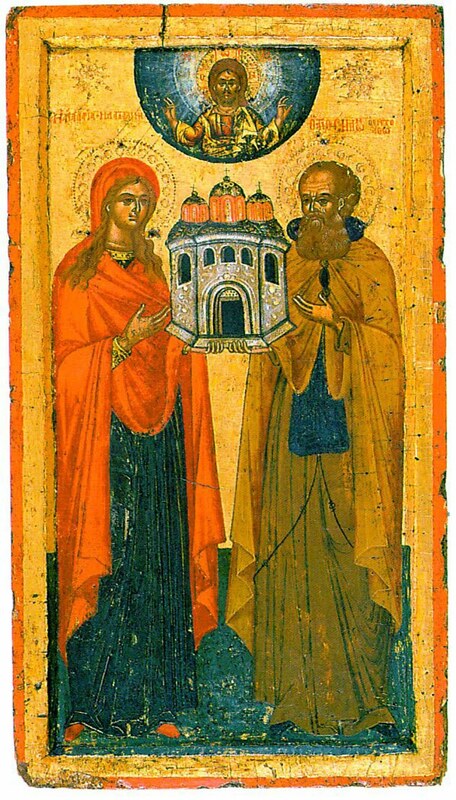 Therefore, they left Constantinople and journeyed to Mount Athos, establishing themselves in a cell near Karyes. There they devoted themselves to prayer, fasting, and vigilance. Hearing of the wisdom and virtue of St Dionysius, many monks were drawn to him, and asked him to be their Elder. He agreed to this with some reluctance, but found that guiding others in the spiritual life left him little time for his own spiritual struggles. With so many people around him his soul was not at peace. Therefore, St Dionysius and St Metrophanes proceeded into the desert of Mount Athos in search of even greater solitude. Somewhere between St Anne’s and Katounakia, they found a cave and made it their abode. This would be the future site of Little St Anne’s Skete, and they were the first to settle at this place. 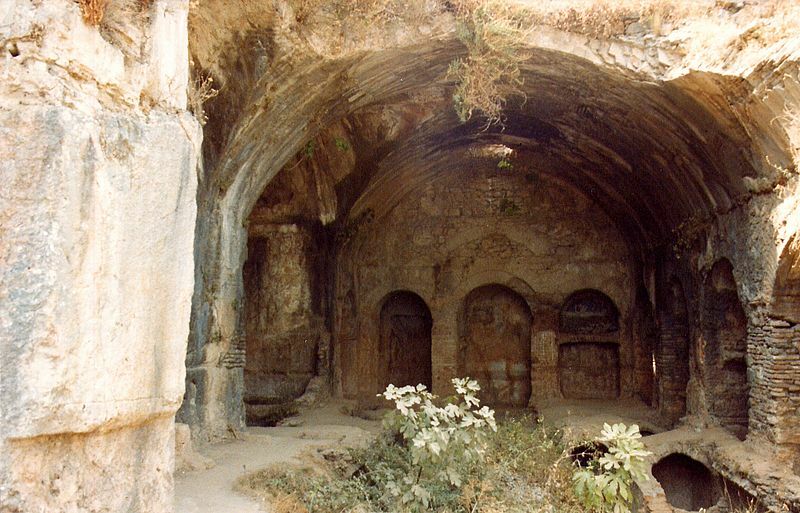 In that small and humble cave, they lived a godly life which was equal to that of the angels. In their spiritual struggles they fought against the stomach’s need for food, and against the body’s need for sleep. They restricted not only the types of food they ate, but also the amount they consumed at meals. By limiting the amount of time for sleep, they were able to devote themselves more to repentance and prayer. 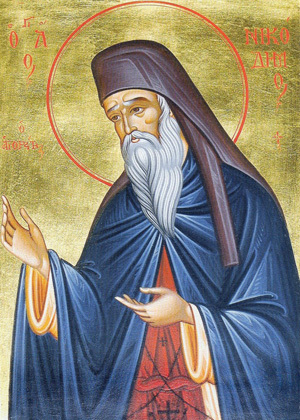 According to the ever-memorable Father Gerasimus of Little St Anne’s, the twentieth century hymnographer of the Great Church (Constantinople) who composed more than 2,000 services (including the service in honor of St Dionysius and St Metrophanes), Hieromonk Dionysius fell asleep in the Lord on October 6, 1606, and his disciple St Metrophanes reposed shortly thereafter. At Little St Anne’s, however, both St Dionysius and St Metrophanes are commemorated on July 9. A church was built in 1956 at the site of their cave, and was dedicated to these saints. You consumed the roots of the passions with divine coals, and shown on Athos ascetically, for shining with the unwaning light, you were shown to be equal to the God-bearers, O wise Dionysios, and divine Metrophanes, entreat that great mercy may be granted unto us. That we may cry, hail, O God-bearers. 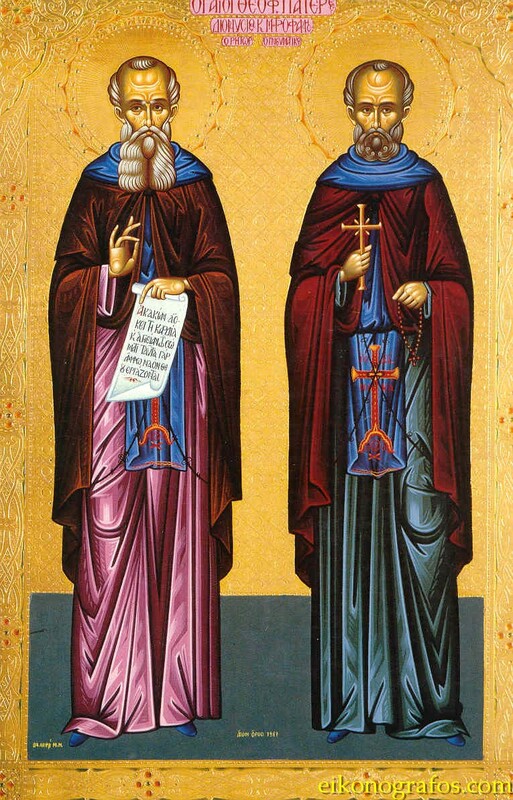 Hail holy dyad of the Righteous, who walked upon the earth blamelessly in life, with Dionysios, and Metrophanes the godly, as divine healers, of the Holy Trinity. 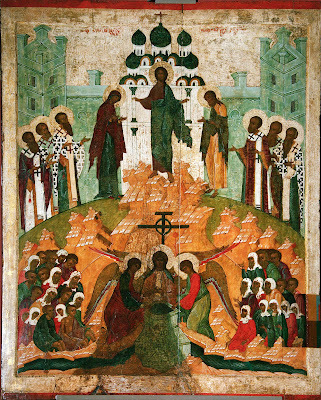 "For Lazarus also, whom the Lord raised up..."